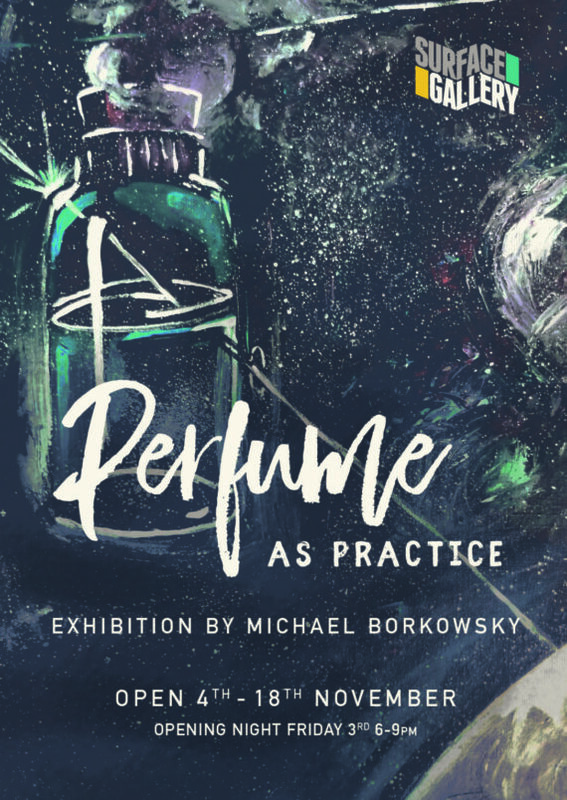 Perfume as Practice will see 20 themed perfumes on display – each a portrait of another artist. I will be on hand to provide insight into my approach to perfume making, and there’ll be refreshments available. I hope you can join me for a fun and fragrant evening! October will see me utilise this blog for documenting, describing and assessing my Orchard Square artist’s residency. We’re just over a week in and I feel as though I have began to assert my creative integrity within the space. 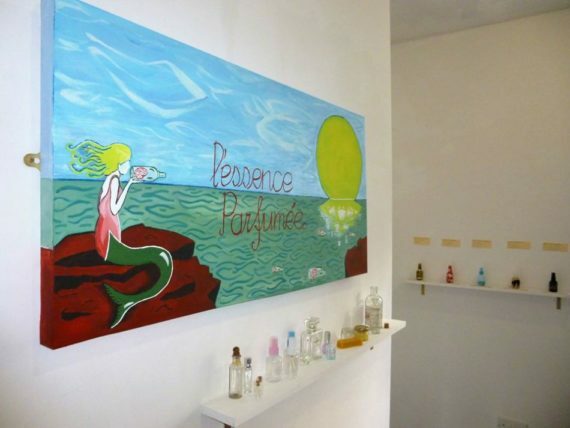 It has become clear that my audience doesn’t initially expect to have a perfume portrait made for them in situ when they enter the space. And as such, are not often able to afford the time necessary for me to complete one. That said, they do often fully engage with the perfumes on display as well as my unique approach and position within perfumery and contemporary art. Everyone seems to ‘get it’ instantly; Reaffirming my belief that perfume holds a viable and valuable position within contemporary art both as a means of communication and as a medium that can be utilised. As we approach the final weeks of the residency it’s clear that, although footfall and overall attendance will not be huge, there is a gentle momentum that warrants repeat visits. So I am still optimistic and motivated going forward. As every day of October will involve either working in my residency or working in other employment, I seek to take measures to prevent mental and physical fatigue. I have, for example, changed my diet a little in order to distribute an even amount of energy throughout the day. I’ve also tried (with varying degrees of success) to cut out junk foods. 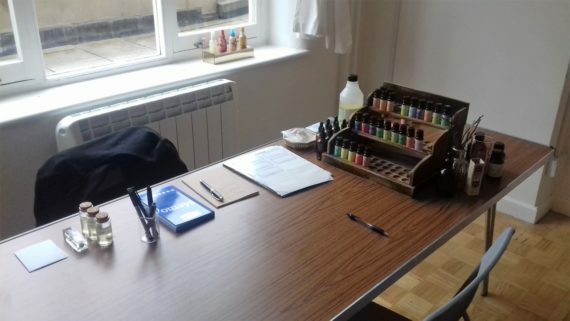 This sort of physical challenge is a somewhat unexpected quirk, but frankly I’m enjoying living a healthier lifestyle and find that it informs my mental aptitude when creating perfumes with immediacy and in situ. And what of an audience? Well, footfall is a little low but the effectiveness of word-of-mouth is not to be underestimated; around half of my visitors have attended due to hearing about it from their friends. Constant pushing of the project on social media has also attracted attention and as such I have set myself a target of being able to create 30 perfume portraits within the space before the residency ends. This is a reasonable target and one that will eclipse the ‘most amount of perfume I’ve exhibited at one exhibition’ record set by my first ever Perfume as Practice solo show at Bank Street Arts last year. But it’s a target that I strive towards as it will provide confirmation of a well attended residency. Whether it’s a well regarded residency or not will rely on continued efforts by myself to make it the best it can be. October will see me utilise this blog for documenting, describing and assessing my Orchard Square artist’s residency. The residency affords me one month housed in what is nominally a retail unit in the heart of Sheffield city centre. Positioned in between Starbucks and Waterstones, my residency aims to confound expectations of another product with highly commercial connotations – perfume. 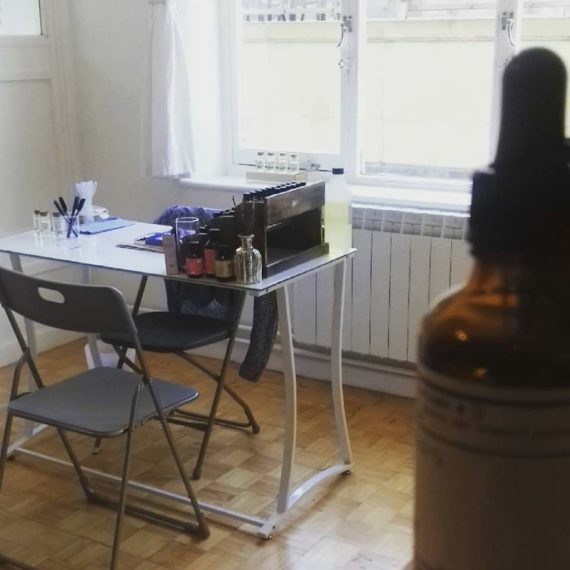 My residency provides other artists with a consultancy service, and the perfumes will be designed as an intimate and direct response to the thoughts, desires and personalities revealed by the artists willing to participate in the process. The perfumes will then be displayed as portraits that capture the essence of artists living and working in Sheffield’s collective communities. 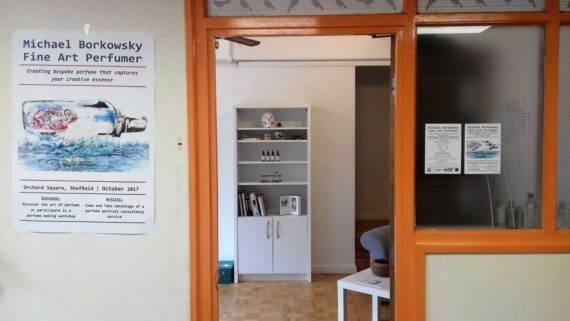 The residency began on Saturday, and as such the first few days have involved getting acquainted with the space. I want my audience to be directed to alternative ways of considering perfume and what perfume can accommodate within a contemporary art context. But I also want to challenge preconceived notions of how artists occupy public spaces. So in terms of displaying work, I want to move away from designing a conventional exhibition and strive to achieve something more interwoven with the consultancy process. Exactly how this will emerge is yet to be seen, but I still have over three weeks to refine the space. Onwards and upwards!